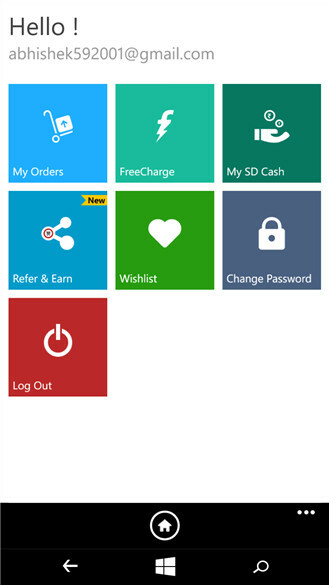 The Snapdeal Windows App is your gateway to a fast, easy and secure mobile shopping experience on-the-go. Snapdeal has the widest assortment of over 23 million products in categories like mobile phones, electronics, fashion, footwear, watches, jewellery and more making it India's largest online marketplace! Shop anywhere anytime with this free App. Here’s why we are India’s favorite online shopping destination! Secure: 100% payment protection guarantee with TrustPay. 7-Day-Easy Returns. Fast: On-time delivery. Free shipping to 5000+ cities in India. Track your order status. Authentic: Shop a vast selection of new, genuine, high-quality products at unbeatable prices. Top Brands: Find brands in fashion and apparel like Vero Moda, Hidesign, Carlton London & GAS. Most Popular: Our best selling electronics include Acer, InFocus, JBL, Samsung and Micromax. Access: Instant App notifications on offers, discounts, daily promotions and exclusive deals. Explore: View multiple product images. Item details & specifications. Reviews & ratings. Compare prices. Share: Recommend products through WhatsApp, Facebook or email. Refer the App to friends & family and you both win rewards. Shortlist: Save items you love to your shortlist to shop on a later date. Discover: Check out personalized and curated Collections of hand-picked items just for you. Find your favorite brands across popular categories like mobile phones, electronics, fashion, footwear, watches, jewellery, home appliances and much more. Discover trendy new styles from a vast selection of top apparel brands like Vero Moda, Puma, Hidesign, Carlton London and GAS. Shop for best selling brands in electronics such as Acer, InFocus, JBL, Samsung and Micromax. Browse millions of products on our user-friendly app. View product images, item details, specifications, reviews and ratings. Access exclusive deals and discounts. Find big savings on daily promotions. Get real-time notifications on App offers and upcoming events. 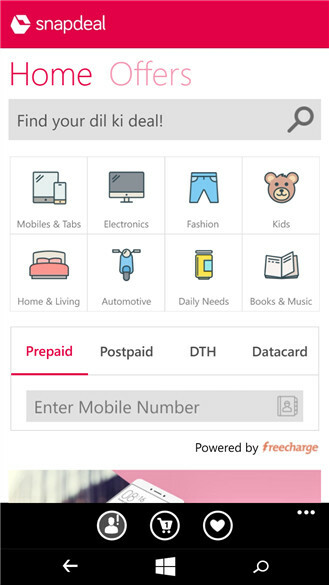 Snapdeal has expanded its offerings to include online recharge and bill payments on the App itself using FreeCharge! Pay for your prepaid mobile recharges, postpaid mobile bills, electricity bills, dth recharges and more in under 10 seconds. Your account credentials now work on both FreeCharge and Snapdeal. Save your account details on Snapdeal for a quick repeat experience. Enjoy amazing discounts and cashback on transactions across both platforms. Buy products with confidence using Snapdeals' TrustPay 100% payment protection guarantee. Choose from a variety of safe and convenient payment options and track your order delivery status. Our 7-Day-Easy Returns policy makes it very easy to return or replace an item. You can cancel your order any time before delivery. Get your orders delivered on-time using free shipping services to 5000+ cities in India. Shop anywhere anytime with this free App! What does this work on: This app works on Windows 7 and later versions.